A great pick for students and other drivers with long commutes, the new 2019 Chevrolet Sonic is a compact sedan known for affordable fuel economy and easy maneuverability. It runs on a 1.4-liter 4-cylinder engine that is able to produce up to 138 horsepower and 148 lb-ft of torque for a quick and engaging drive. Thanks to its efficient engine, aerodynamic design, and lightweight construction, the 2019 Chevy Sonic is able to achieve an EPA-estimated 27 city / 38 highway MPG. Drivers in the Green Bay area interested in this practical compact sedan can find it here at Broadway Automotive. 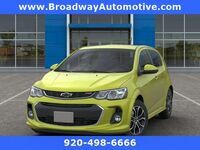 Drivers in the Green Bay area looking to get behind the wheel of the new 2019 Chevrolet Sonic can find it here at Broadway Automotive. We currently have a selection of new models available for shoppers to choose from, which you can view here in on our site in our online inventory. After taking a moment to browse our available vehicles, if you find one that you like, we encourage you to reach out to our staff for more details and to set up an appointment for a test drive. You can give us a call or click the button below to fill out an online contact form and we’ll be happy to schedule a test drive in the 2019 Chevy Sonic in Green Bay for you! We look forward to hearing from you! Interested in a Chevrolet Sonic?